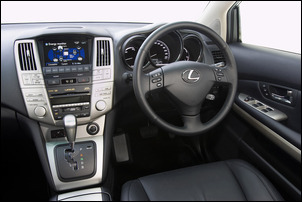 When Toyota chose to capitalise on its hybrid technology by releasing hybrid Lexus models, many – including us – thought it simply represented a devaluation of the concept. After all, the groundbreaking Prius – easily the world’s best-selling hybrid and one of the most important cars ever released – uses a petrol-electric driveline clothed in a highly efficient, well packaged body. 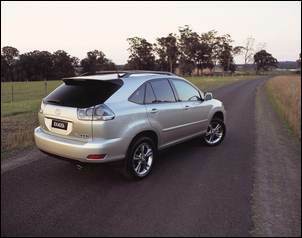 But cars like the RX400h are (in relative terms) large, lumbering, un-aerodynamic and heavy. So why put a hybrid driveline in a car like that? Well, having now experienced the RX400h, we can better see where Toyota is coming from. 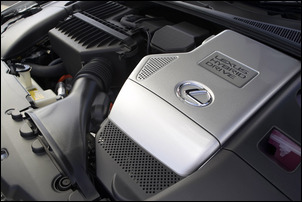 Yes in absolute terms the fuel economy remains unscintillating – although for this class of car it’s good – but the way Lexus engineers have taken advantage of the opportunities that the hybrid technology allows has made for a very effective vehicle. Despite being due for replacement (which incidentally means you currently should be able to score an excellent new car price reduction), the RX400h still looks quite stylish. The proportions and detailing are good; about the only angle where the car looks a little odd is from directly behind. Build quality is right up to the very high standard of all Lexus cars, with the doors shutting superbly, equal width panel margins and excellent presswork of the body panels. Under the bonnet you’ll find – as is the case with lots of cars these days – a series of huge dress covers. But delve further and there’s a 3MZ-FE 3.3 litre 24-valve V6 petrol engine that develops 155kW at a relatively low 5600 rpm. Peak torque is 288Nm at 4400 rpm. The electric power is provided by no less than three electric motor/generators. As is the case with all Toyota/Lexus hybrids, two of the motors are contained within the ‘transmission’ casing, but the other electric motor is positioned at the back of the car, driving the rear wheels. In fact all rear-wheel drive is provided by this electric motor alone – there is no mechanical driveshaft connection from the front to the back. The front electric power output is a considerable 123kW at 4500 rpm, while a high 333Nm is also available. At the back, max power is a much lower 50kW. Combine all these outputs and Lexus quote a maximum of 200kW (because of the way the power outputs are linked, you can’t just arithmetically add the numbers). The electric and petrol powers are seamlessly combined by the very sophisticated control system. Driving is two-pedal automatic style. The car starts moving on electric power and then the petrol motor kicks in. However, as you move along, the petrol motor might be on or off, the electric assist might be occurring or not occurring, and regenerative braking might be operating – or braking might be by the hydraulic discs. The central LCD can be configured to show all these power flows, but in short, the driver doesn’t need to make even a single decision as to what is occurring. So how does all this driveline complexity come together? Generally, very well. Because the RX400h is primarily a front-wheel drive car with relatively low power rear-wheel assist, the all-wheel drive system feels a little different on the road to a traditional four-wheel drive car. That’s not to say the all-wheel drive system is for show alone – up a very steep, wet driveway that would have caused major problems to a front-wheel drive, the RX400h used all wheels to gain traction and easily climbed the slope. That’s probably a pretty good real-world application of the system – use on roads made slippery by rain, mud or snow, rather than being driven off the beaten track. Push the car hard and the front-wheel biased system can torque steer, the feel and weight of the electric-assist steering altering markedly. Point-and-squirt in urban, wet road conditions and a firm hand needs to be kept on the steering. With the presence of the excellent stability control, it would be hard to get into trouble - but this isn’t a car that remains unfussed no matter what the conditions and driving style. In more gentle use – eg on country roads - the handling is very good and the grip levels are high. Power and response are both excellent. One of the advantages of hybrids is the immediate availability of electric motor torque, and this can be felt in the 400h. Put your foot down and the car lunges forward as if it has a much larger engine than just 3.3 litres to haul round the 2 tonnes. So it goes well – but what of the fuel economy? The official figure is 8.1 litres/100km and on test over a wide variety of conditions, we got 10.4 litres/100km. Despite the protestations of Lexus, we don’t think that is a sufficiently convincing improvement over the many diesel-powered cars also available in this class. 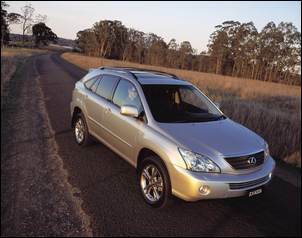 In fact, we’d go further and suggest that the RX400h is not a good buy if you’re concerned only with fuel economy. But as an overall package, the RX400h works very well. The equipment level is high, with automatically steering HID headlights, high quality sound system with DVD playback capability on the colour LCD, electric (and heated) seats for both the driver and passenger (two memories on the driver’s seat), and all three rear vision mirrors having an auto-dimming function. There are airbags everywhere – driver and front passenger, driver knee, front side and full-length curtain – and the brother RX330 has a 4-star crash testing result. The front seats are comfortable and have fold-down armrests. Pop-out door pockets are provided and the glovebox is large. Manipulate the reach and height electrically adjustable steering column and a good driving position is easily found. The instruments and controls are superbly clear. But there are two shortcomings in the way the equipment works. Like that fitted to other Lexus models, the navigation system is poor. The voice instructions are repetitious and often contradictory (an actual example: “The freeway is on the left” followed without pause by “The freeway is on the right”); the interface is not intuitive and prevents the input of any data (even by the passenger) when the car is moving; and the navigation system can be quite slow to react. The other deficiency is the cruise control: on hilly country roads, its speed regulation is terrible. In fact, the system feels like it hasn’t been recalibrated for the hybrid driveline. The rear seat has good – but not fantastic – space. Kneeroom is fine but space for the feet is a little tight, and the very tall will have insufficient headroom. Rear passengers are provided with door pockets and reading lights. A fold-down central armrest incorporates storage space and cup-holders, and air outlets are located on the rear of the centre console. The rear seat folds on a 40/20/40 basis, with the ‘20’ being the centre section. This allows the carrying of two rear seat passengers while still allowing long loads to be fitted in. When folded, the seat backs lock securely into place. 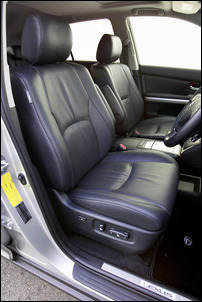 In addition to folding (nearly) flat, the rear seat backrests can be individually adjusted for recline angle. Moving further rearwards, the back door can be remotely opened by the key fob. Despite initial scepticism, we found that in practice this works very well. An example use: a mother carrying a child and wanting to load some groceries needs just press the remote button to see the door slowly open in front of her. Talking of children, the child restraint anchorages are located on the back of the rear seat (so the straps don’t intrude into the load space) and the wide-opening doors and high seats makes placing children in the rear an easy task. Rear load space is fine for this type of vehicle. The cargo blind can be set to automatically retract when the rear door is opened, and beneath the floor are two normally hidden storage compartments. Two rear load area lights are fitted and there’s a 12V outlet. The spare wheel is beneath the car. A warning triangle, first aid kit and valet pack are provided. Cargo tie-down hooks finish off the impressively equipped and designed rear. So what to make of this car? 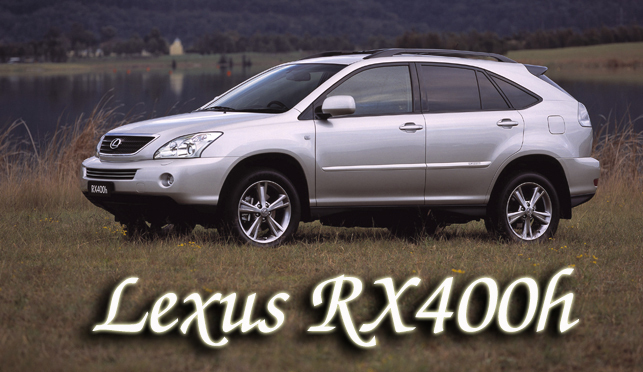 You wouldn’t buy the RX400h solely for its fuel economy, or performance, or handling, or equipment, or interior design. But taken as a package, the RX400h adds up to a car that is greater than the sum of its parts. 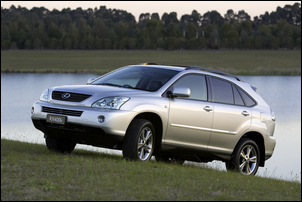 The Lexus RX400h was provided for this story by Lexus Australia.